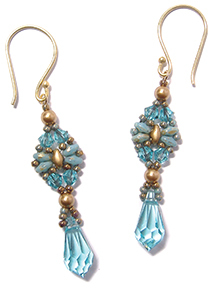 Free step-by-step illustrated instructions for these easy earrings that match my Dragonfly Bangles pattern. Perfect for stash busting. Step 1: Thread your needle with 2-3 feet of FireLine. 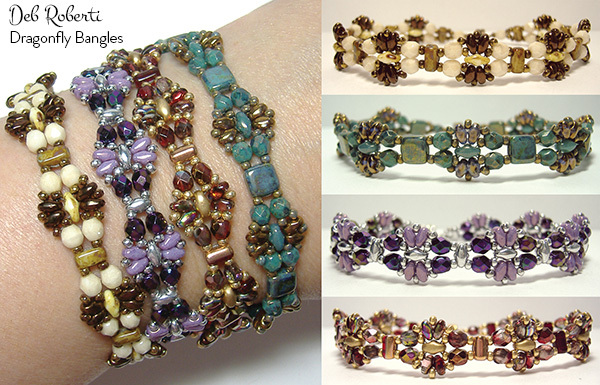 Leaving about a 6-inch tail that you can weave in and make disappear at any time, string a Color1 4mm bead, two seed beads, another Color1 4mm bead, a seed bead, a SuperDuo bead and a seed bead. 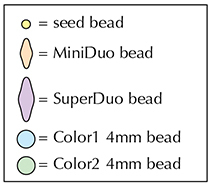 Step 4: String a seed bead, a Color1 4mm bead, two seed beads, another Color1 4mm bead and a seed bead. Step 8: String a Color2 4mm bead and a seed bead. OPTIONAL: Instead of a jump ring, you can go directly through the loop on your earring finding if you prefer not to use jump rings. 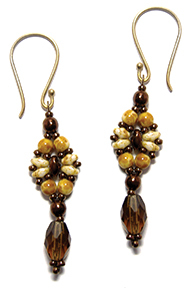 There are several different ways to add accent or drop beads to your earring. Instructions for each follow. Complete Step 1 to Step 17. The vertically-drilled accent bead can be any bead type or size you prefer: fire-polished bead, crystal, pearl, gemstone, teardrop, etc. 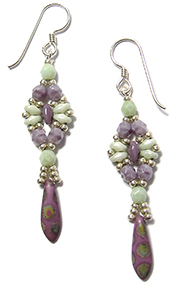 Weave your way back into your earring, knot and cut your thread. Attach your earring finding to the jump ring. Complete Step 1 to Step 17. 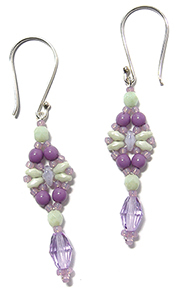 You can use any top-drilled bead type or size you prefer, including Czech one-hole dagger beads (photo on right). Note: You may have to adjust the number of seed beads used here and in the next step, depending on the amount of space between the drill hole and the top of the bead. Complete Step 1 to Step 17. 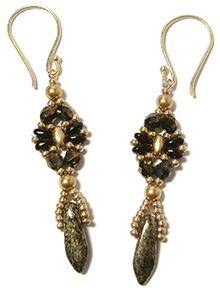 Weave your way back into your earring, knot and cut your thread. Repeat for the tail thread from Step 1. Attach your earring finding to the jump ring.